Will Smith's tricked-out trailer was sent packing Wednesday after complaints from residents in the neighborhood where his new film is being shot. The location shoot for "Men in Black III" has clogged the narrow streets of Manhattan's Soho district for several days. But among the two dozen trucks and trailers deployed there, the most prominent was the luxury apartment-on-wheels occupied by Smith. The double-decker digs were larger than many Manhattan residences and had locals up in arms about its size, noise and fumes. "I love Will Smith, but this is about survival," said Anessa Rahman, co-owner of an antiques store located a few steps from the curbside spot where the actor's trailer had been parked. 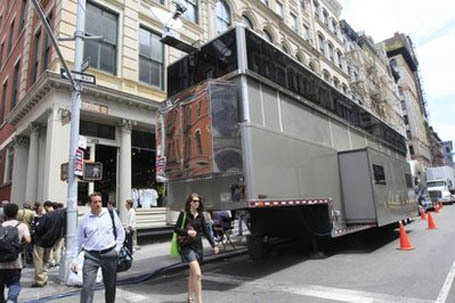 The megastar has docked a gargantuan, double-decker moveable mansion for his "Men in Black III" shoot smack in the middle of SoHo -- even though he's renting a luxury apartment less than a mile away. The production arrived Monday with around 25 trucks -- including a second, 55-foot trailer featuring Smith's full-sized gym. Hey, if he had the permits, then get used to it. Where’s that famous New Yorker pride in your right to be rude and selfish? Another view. Looks like a beautiful day in Manhattan. You can hear the birds chirping, too. Is it just me, or does the second fellow they interview start out talking like a New Yorker and shift into a Scottish accent of some kind? The real story here? They’re shooting Men in Black 3, and we still don’t know if they have an actual script. Details, details. They could shoot ten hours of improv, edit it into some sort of story, add lots of CGI, put the actors in the poster in the MiB garb, and it would make enough money to keep that trailer’s engines running 24/7 until 2189.